(Yorktown Heights, NY — April 10, 2019) Booked Parties announced that in partnership with the Jefferson Valley Mall,they will be hosting a launch event promoting many of the area’s leading young entrepreneurs for the first ever “Mini Movers and Shakers” celebration. Speakers will include local jewelry designer Samantha Auburn Levine from Auburn Jewelry, who began designing jewelry in high school and is now being featured in JCrew, as well as Octavia Ford, currently the Director of Volunteer Engagement & Partnerships for the Girl Scouts Heart of the Hudson. Both speakers will share their experiences of entrepreneurship and the journey they’ve taken to become successful in their business careers. Booked Parties began spotlighting these young CEO’s in their series “Mini Movers and Shakers” in 2018. The children range in age from kindergarten to high school seniors and are a creative and energetic group, from towns around Westchester, Connecticut and New York City, who have become successful and savvy business owners, identifying niche business models. They have leveraged the power of social media to drive their brand recognition and business growth. The event will showcase these young individuals along with like-minded young entrepreneur supporting businesses and invite members of the community to come out to meet, greet and hear from all of the amazing children who have been featured by Booked Parties over recent months.Breezemont Day Camp, located in Armonk, NY, is the main sponsor of the event. 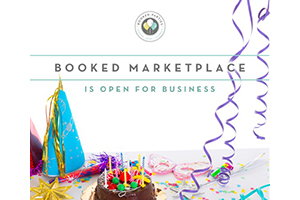 Booked Parties is a children’s birthday party resource website and booking platform providing seamless planning for all of your children’s birthday and special events. Our tagline says it all: Compare, Book, Celebrate— parents can sort through the website’s comprehensive list of venues and vendors and book their party or event with a few clicks of a button. Booked Parties filters searches by location, budget, venue and vendor and by ratings and customer reviews. For more information about Booked Parties, visit the website at: www.bookedparties.com. Jefferson Valley Mall is Yorktown Heights’ premier shopping destination. The town center is home to more than 80 national and local retail, dining and entertainment options, as well as numerous events and activities throughout the year. A dynamic offering of things to do along with things to buy keeps guests engaged and returning often. Jefferson Valley Mall is open seven days a week; Monday – Saturday 10 a.m. – 9:00 p.m. and Sunday 11 a.m. – 6 p.m. For more information, please call (914) 245-4688 or visit jeffersonvalleymall.com. Like us on Facebook at facebook.com/JeffersonValley and follow us on Twitter @JeffersonValley and Instagram @JeffersonValley.